Awareness is how we attract our ideal buyers. You can’t sell anything without an audience. In online marketing, the first step in reaching your ideal buyers is awareness. If they don’t know anything about you, they simply will not buy from you. When working with my clients, the first thing I always tell them is “People do not buy from people they don’t know” and we work on building an audience. If you were an online entrepreneur and wanted to reach your buyer persona, would you simply put an ad out globally asking them to buy your online course or coaching package and hope that sales came in? This is something I see every day and it just doesn’t work, because those who see your ad do not know who you are. Are you the best coach in the world who can help them move the needle in their business? You need to tell them that and show how you can solve their problem first. It’s all about value in the awareness phase of the marketing process and showing them that you understand their problem and can help, so it’s important to make a connection and lead them on what’s called “The Buyer’s Journey” and every journey starts with a single step. At the top of our funnel, the objective is to attract as much high quality traffic as we can so that reaching our buyers isn’t a futile effort. We want those we can help with their problems and your buyer persona has a problem. They may not know what they need to solve it, and they may not even know enough to actually state what their needs are yet. They are experiencing pain and just want to put an end to what is causing them discomfort. They know that their head hurts and may even know that it’s not a normal headache, but a migraine. They are looking for an end to their pain. If I was Tylenol, these are the SEO keywords I would use to lead buyers to my website because I know the terms they are using to find a solution. How do you attract your ideal buyer if you’re the marketer for the Tylenol brand? The commercials show a woman sitting at a desk, head in hands with a pained look on her face. The announcer uses the language related to her problem (see search terms above) to let you know that Tylenol can get rid of that headache – FAST. We know why these commercials play all day: they are attracting those who are suffering from headaches and “touching” them multiple times. The more we see the commercials, the more we become aware of Tylenol and the fact that they can ease our pain. See how that works? If I woke up tomorrow and created a new pill to help headaches, would it fly off the shelves? Not until I bring awareness to those I am trying to attract by using advertising and marketing methods that would HAVE to rival Tylenol’s strategy, because let’s face it, everyone knows what Tylenol is and it’s been a trusted brand for decades. We know Tylenol, we like Tylenol, we trust Tylenol and we are aware that they are the solution. It isn’t something new that we are unsure of, and that’s the key to the awareness phase: reaching your buyer persona and letting them know that YOU are the ONLY solution for them. When in the awareness phase, our marketing should bring awareness to their pain in a way that shows that we understand it and can fix it. Awareness means putting a name to the pain and speaking their language so that we are seen as an authority, but it’s also the first step in the know, like and trust relationship. Get out there and spread your unique solution. Use social media to become known to your audience as an authority and start working on the know, like and trust that’s needed for success. Call to Action: lead them somewhere with directions. Do you want them to click on your link? Tell them. Using a bright image they can relate to, I’m asking a question that my ideal buyer would say yes to, offering a solution with 3 benefits of using said solution and giving them directions on where to go. 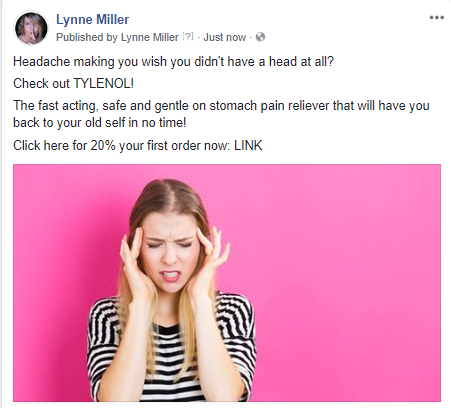 I’m attracting my ideal buyers at the top of my funnel with this post and speaking directly to their pain, I mean who doesn’t wish they didn’t have a head that aches? Give it a try and create your next social media post aimed to attract your ideal buyer and start building your audience, because you just can’t sell without one. But you said people don’t buy from people they don’t know, didn’t you? You get the idea here: VALUE! Since no one will buy from someone they know, it’s important to introduce yourself and start warming up those in the awareness phase to bring awareness to their pain and showcase how you can alleviate it. Now it’s time for you to bring awareness to the pain of your buyer persona and get visible!